Trim a strip of fabric large enough to cover your pot. Mix a little water into the tacky glue and ensure it is thoroughly covered. At the back of the pot, cut the fabric so it just overlaps and use more glue to hold it in place. Apply more glue over the entire pot and allow to dry thoroughly to finish. Apply glue all over the pot and press the fabric into place ensuring there are no bubbles. 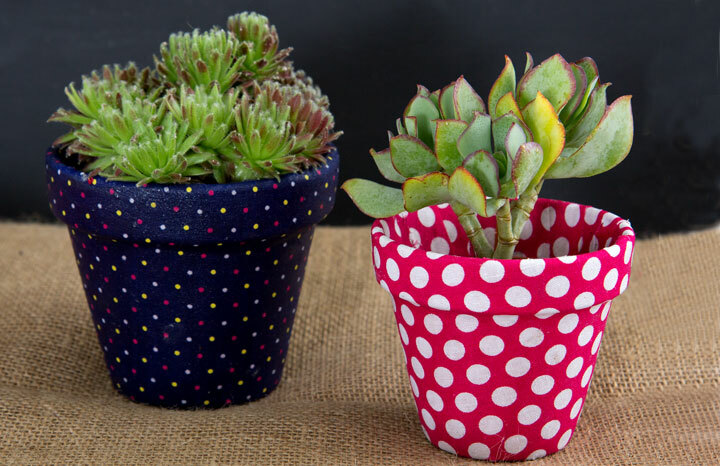 Trim the fabric so that it overhangs approximately 2cm at the top and bottom of the pot. Snip down to the edge of the pot to to make tabs and fold these over to the inside and to the bottom of the pot, securing with more glue.